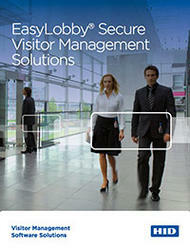 to each visitor when they are badged by EasyLobby SVM. Satellite time stamps the visitor’s entry and exit at that station through a barcode scan. Customers should purchase one (1) copy of Satellite for each location where internal control and monitoring is desired. Satellite cannot create new visitor records, modify existing records, or print badges; it is a supplement to the EasyLobby SVM security architecture, not a substitute for EasyLobby SVM.